Delicious side dishes are a really important part of my family’s menu. When you start a “diet” like SCD or Paleo for health reasons, vegetables become much more fundamental to your nutrition than before. After all, when you cut out gluten and grains, you need to eat more of something. For me, that is delicious vegetables. And plenty of them! 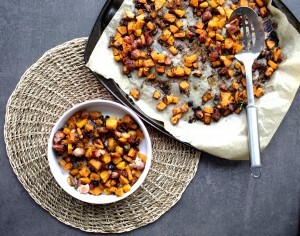 We are big fans of butternut squash in our house. It almost feels like a grain but it’s not. It has that ability to make you feel full like a potato. Last week when my husband and daughter were having chips with their dinner I decided I needed something a bit different. 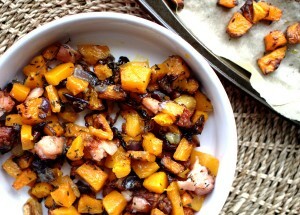 Hence my new favourite side dish: Roasted Butternut Squash with Bacon and Thyme was born. It’s pretty epic. Actually my husband and daughter preferred mine to their beloved chips! This dish goes great with anything but is particularly good with roast chicken. You should buy good quality bacon. I use “Clonakilty” rashers here in Ireland because they have no added sugar. Look out particularly for the ingredient “dextrose” in bacon, and avoid it! They do contain nitrates as it’s almost impossible to find nitrate-free bacon here. Elaine Gottschall said in “Breaking the Vicious Cycle” that nitrates were allowable once a week. In all honesty, I sometimes have it more than once a week because I’m not perfect. Also, everything tastes better with bacon. 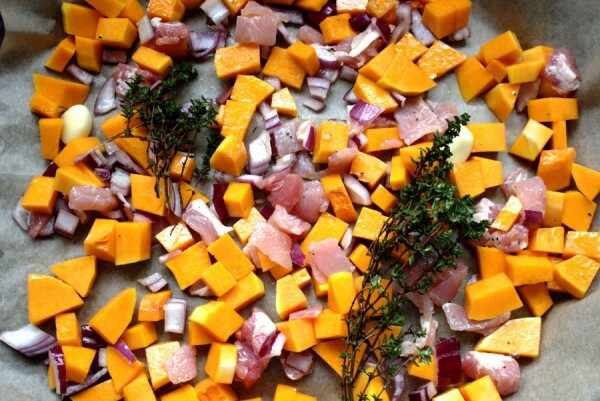 The only bad thing about butternut squash is having to peel and chop it. Let’s be honest here. It can be a real pain. My husband often peels and chops it for me and then I keep it in the fridge, covered to roast the next day. I’m a lucky lady 🙂 We are all about the meal prep in our house! Sunday mornings are like a vegetable-chopping factory. This saves us so much time during the working week. Back to this side dish. It’s actually less of a side dish and more of a wow dish. This Roasted Butternut Squash with Bacon and Thyme is sure to make your make your meal sing! 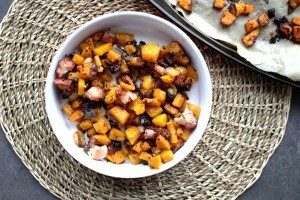 Simple but deliciously tasty healthy dish of Roasted Butternut Squash with Bacon and Thyme. Gluten-free, grain-free, Specific Carbohydrate Diet and Paleo-friendly. Preheat the oven to: 180°C Fan, 200°C electric, 390°F or gas mark 6. 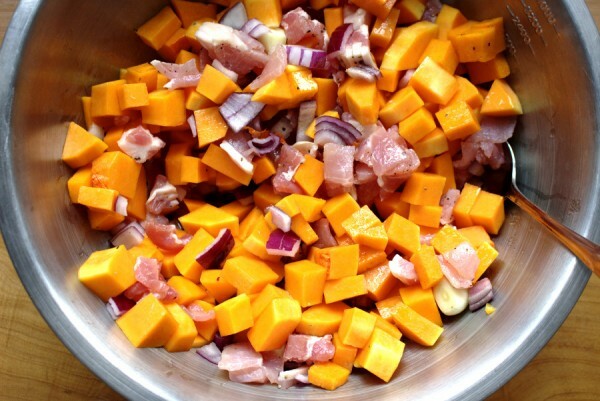 In a bowl, mix the ingredients and stir well. Divide out among two baking trays lined with parchment paper. I find it cooks better when spread out a little. Roast for 45 minutes, stirring twice before than to ensure that it doesn't burn. Enjoy!